Is the Pain I’m Feeling an Injury or Just Soreness? We’ve all felt soreness after a workout. Sometimes it’s immediate and other times you wake up a day or two later and feel like you got hit by a bus. Most of the time there’s this odd satisfaction that we get from being sore after a good workout. Every time you go to stand up and feel the achy sensation of your heavy legs yelling at you it brings a twisted sense of accomplishment for the work you put in to cause this discomfort. When did the pain start? Was it during a workout, immediately after, or 1-2 days after? What were you doing when you first noticed pain? What does the pain feel like and where is it located?? What makes the pain better and what makes it worse? Are there certain movements that you do that aggravate the pain? Has it been getting any better since you first noticed it? Does it feel different than soreness you’ve experienced before? Were there any changes in your daily routine or workout routine? Did you recently take any time off from working out? Asking yourself these questions can really help get to the bottom of what is causing your pain and help determine if the pain you’re feeling is just soreness from working out or the start of a new injury. 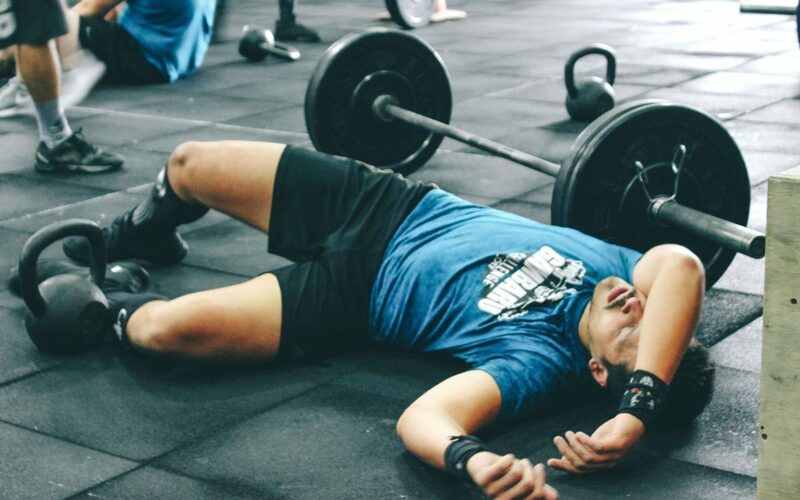 In general, an acute injury is still going to be much more painful than soreness from working out even if you had a really hard workout or changed up your routine. Most of the time pain from an injury is first felt during the activity and gets worse after the activity is stopped. Injuries tend to be more of an intense sharp pain with certain movements and are very localized to where you can point to the area of pain with one finger. One of the easiest ways to differentiate an injury from soreness is that soreness typically goes away within 1-3 days of onset whereas an injury will usually persist if left unresolved. Although soreness can be pretty painful, it is usually less intense than most injuries. Additionally, soreness from exercise does not tend to be localized to just one smaller area and is usually present in several muscles and on both sides. Soreness is almost never present during a workout and is typically felt hours or days after an activity. If your pain goes away within a few days of onset than it is most likely just muscle soreness from exercising. The term “DOMS” refers to Delayed Onset Muscle Soreness and it is the feeling of soreness that often happens 1-2 days after a workout. We’ve all felt it before — you did squats in the gym a couple days ago and think “Wow, that went great. I can’t believe I’m not more sore from that workout”. Two days later you wake up and can hardly make it up and down the stairs or get up from a sitting position. This delayed feeling of soreness is what we refer to as DOMS. But what causes DOMS? Originally, it was thought that this delayed soreness had to do with increased lactic acid buildup in the muscles. This was put to rest after a few studies conclusively demonstrated that lactic acid levels return to normal within hours of completing exercise. The next theory that gained traction for a while had to do with inflammation being the cause of DOMS. However, the natural inflammatory response takes place within minutes and cannot adequately explain the 1-2 day delay in soreness experienced. The most recent research available demonstrates that small micro tears within our cell membranes occur in response to the “trauma” of exercise. This causes chemicals within the cells to leak into our bloodstream and accumulate in the vascular beds of our muscles, thereby setting off pain receptors and causing the feeling of soreness. This process takes time — typically anywhere from 12-48 hours and is why you feel soreness so long after that hard workout. If you haven’t worked out in a while or perform a particularly taxing workout you are more susceptible to suffer increased micro-tears because the muscle cell membrane is thinner. Once your body has properly adapted to the stimulus of exercise again your muscle cells will be less likely to suffer micro-tears because the membrane has thickened. Soreness is natural — even a few days after a workout. Especially if you haven’t worked out in a while, performed a new exercise, or just went all-out on a workout. Ask yourself some of the questions we discussed above if you’re concerned that the pain you’re experiencing is coming from an injury. If you have pain, soreness, and tightness for longer than 3-4 days it is more than likely that you suffered an injury. It is always best to have a professional diagnose and assess any injury concerns. Typically the longer an injury persists, the longer it takes to treat. So don’t let any injury concerns persist and seek out an expert to diagnose and treat any concerns. As always, you can try some at-home treatment with ice, stretch, and rub/roll the injured area. Don’t let any injury worries persist and seek out an expert to diagnose and treat any concerns. Think You Might Be Injured And Not Just Sore?